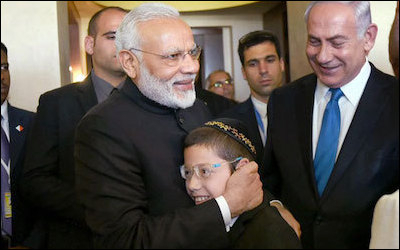 Indian Prime Minister Narendra Modi embraces 11-year-old Moshe Holtzberg in Jerusalem. Known as "Baby Moshe" to millions of Indians, Holtzberg lost both his parents in the November 2008 Mumbai terror attacks. The visit by the Indian Prime Minister Narendra Modi caused many Jerusalemites, like me, a lot of traffic delays. In retrospect, it was definitely a price worth paying. Modi showed remarkable courage by coming to Israel without balancing it with a visit to the Palestinian Authority. His departure from the politically correct symmetry pleased the Israelis and signalled that India decided to act on its national interests. Israelis hope that Modi's pragmatic approach will be emulated by high dignitaries who come to Israel from all over the world. Modi arrived last week, making him the first-ever head of India's government to visit the Jewish state. Israel went out of its way to extend a most warm welcome, underscoring the good personal chemistry between the Indian Prime Minister and his Israeli counterpart Benyamin Netanyahu. The manner in which Israel managed the visit was well appreciated by Indians. "Israel is a real friend and I have really felt that feeling of kinship. I feel absolutely at home here," Modi said during a meeting with President Reuven Rivlin in Jerusalem. He emphasised that the very warm reception was "a mark of respect to the entire Indian nation comprising 1.25 billion people." India is the most important market for Israel's defence exports. Modi's visit reflects the success of the reorientation of Israel's foreign policy. Recognising that there is a shift in the distribution of power in the international system and that the Asia-Pacific region is gradually becoming the centre of gravity for international interactions, Israel has paid greater attention to Asia. Within such a perspective, Israel courted India, a rising global power located in that region. India, for its own reasons, responded positively, turning into the most important market for Israel's defence exports. Israel's export policy is flexible, meeting Indian demands for technological transfer and offsets. The India-Israel Joint Statement hailed defence cooperation, noting that India and Israel agreed that "future developments in this sphere should focus on joint development of defence products, including transfer of technology from Israel, with a special emphasis on the 'Make in India' initiative." Beyond the billions of dollars in defence deals, India and Israel share a common strategic agenda. Indeed, the first paragraph of the India-Israel joint statement states that the friendship between the two states has been raised to "a strategic partnership." Modi explained: "Israel and India live in complex geographies ... We are aware of strategic threats to regional peace and stability ... Prime Minister Netanyahu and I agreed to do much more together to protect our strategic interests..."
In the joint statement, both prime ministers reiterated their strong commitment to combat global terror. "They stressed that there can be no justification of acts of terror on any grounds whatsoever." The Working Groups of the two states on Homeland and Public security were encouraged to implement the agreements in an efficient and effective manner. Also, cybersecurity was recognised as an important area for enhanced cooperation. Interestingly, Modi's visit coincided with a rise in Sino-Indian tensions in the Sikkim border area, underscoring India's threat perceptions and military needs. Israel, on a different scale, is concerned about Chinese behaviour that challenges its main ally - the US. Modi and Netanyahu signed agreements for civilian scientific and technical cooperation. While national security issues, including defence contracts, are an important facet of bilateral relations, it is only one component. The joint statement mentions a myriad of items of mutual interest in the civilian sphere. Looking to deepen ties, the two prime ministers presented a series of agreements between India and Israel for cooperation in the field of space, water management, agriculture, science and technology. In addition, the two countries decided to create a US $40 million innovation fund to allow Indian and Israeli enterprises to develop innovative technologies and products with commercial application. The Modi visit was extremely well covered by the Indian and the international media. It was a great opportunity for Israel not to be seen through the prism of the Arab-Israeli conflict, but as a technological superpower able to attract the attention of rising global powers such as India. Modi's warmth toward Israel was a great public relations benefit for Israel and also a welcome promotion for Israeli products. The Modi visit underscores Israel's status as a technological superpower attractive to the developing world. The many Indian journalists that accompanied Modi were also an important tool to present Israel as an attractive tourist destination. Netanyahu expressed his wish to see many more, "but not too many," Indians coming for vacation to the Jewish State. Netanyahu touted Israel's growing ties with the second-most populous country in the world. Modi's visit serves him well in refuting the accusations from the opposition that his foreign policy leads to the isolation of Israel in the international arena. He can convincingly argue that Israel has become a preferred partner in the international community because it has many things to offer in the defence and civilian spheres. Netanyahu accepted an invitation from his Indian counterpart to visit New Delhi. The visit had already been in the works and Indian officials said the trip would likely take place toward the end of 2017. That will provide an opportunity to check the progress made, identify the blocks hindering the implementation of the agreements and further solidify the ties between the two countries. Efraim Inbar, professor emeritus of political studies at Bar-Ilan University and former director of the Begin-Sadat Center for Strategic Studies, is a Shillman-Ginsburg fellow at the Middle East Forum.